Submitted by Eric Linehan Children's Hospital Washington, D.C. I point my finger to my head, tears streaking down from bloodshot green eyes softly proclaiming "My head hurts.." I was five years old. drenched pillows providing small comfort a cool sleep for hopes to wake pain free. classes, dates, meetings, graduations, concerts. 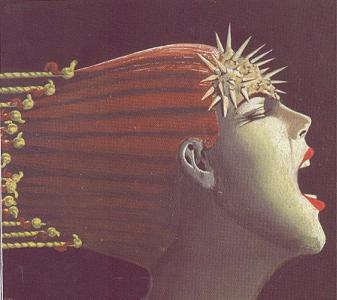 Migraines and headaches have been well represented in art since the 1800's. In fact, early drawings from the Egyptians indicated that treatment of headaches utilized herbs. 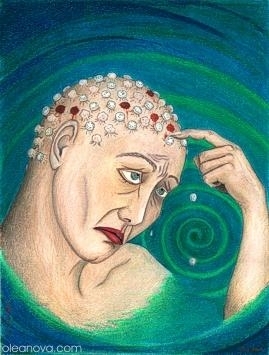 I have presented a cross section of art from a variety of sources to represent the pain of headaches. 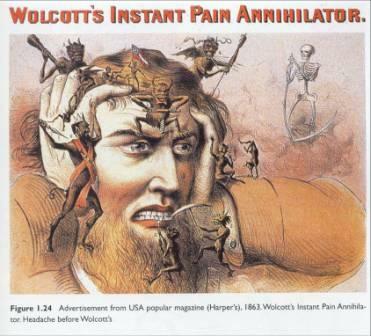 As depicted below, in the mid 1800's, headaches were depicted in advertising as demons of pain attacking the brain. 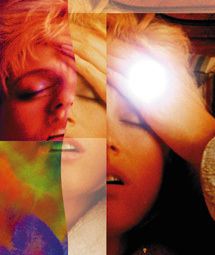 Many artists suffer from migraine and other headaches. 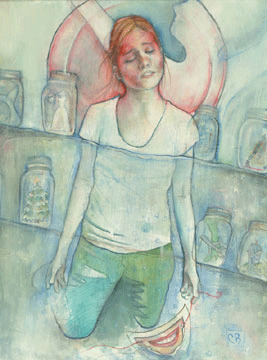 Christa Barnell has had headaches all her life and depicts her pain as being "stuck on a shelf", as if there is no hope and noone cares. Behind the mask of happiness is the face of chronic pain, an excellent depiction of invisible chronic illness. 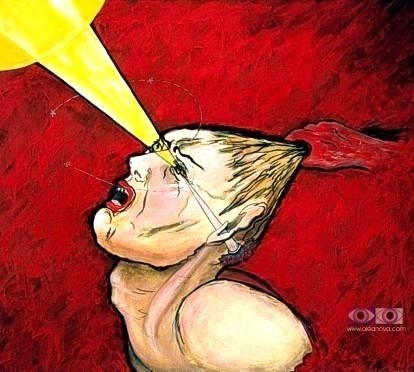 Other artists depict the searing blast of pain that occurs with migraine and cluster headache as a lightening bolt striking the eye. Photo and art from Olea Nova. Many patients tell me that during or after a migraine, they feel as if their hair is being pulled off and the scalp is tender. This is known as cutaneous allodynia, where normal sensation or touch (combing your hair) produced pain. Some headache sufferers feel like they are "pill heads" after years and years of unsucessful treatments and multiple medications, again from Olea Nova. I don't know about you, but at times my head has felt like it was "fractured" like this picture. Return from Headache Poems to Home Page.